Get out your blender and try this fresh tasting beverage. If you like apples, then it’s just the thing. You need a blender to make this drink. As always, I recommend the Vitamix… it does a superb job of completely pulverizing the apple and making a smooth, luscious drink! Wash the apple, then cut it into pieces, removing the core. 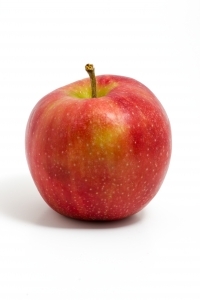 Do not peel the apple, there are good nutrients right under the skin. The amount of lemon juice and stevia will vary depending on how sweet or tart the apple is you are using, and how sweet you like your drink. Blend all the ingredients together until the apple is totally liquefied.